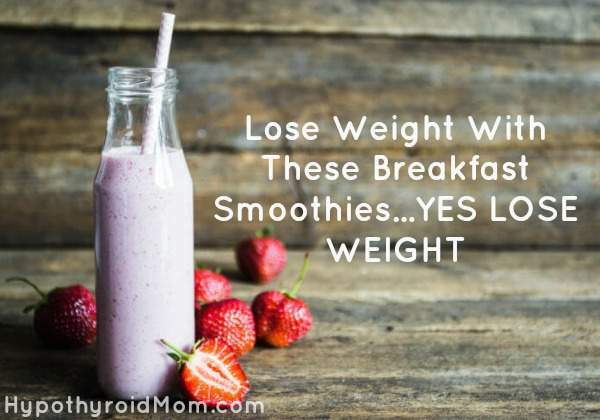 I can’t tell you how many thousands of messages I’ve received over the last four years from Hypothyroid Mom readers struggling to lose weight. It is seriously frustrating to watch the number on the scale rising. I’m on the lookout for simple weight loss tips to help us all. I have a feeling you’ll really like this one. I had a patient not too long ago who struggled to lose weight. A quick look at her food journal revealed why. To save calories, she skipped breakfast and simply sipped on coffee or one of those “skinny lattes” that actually contain a good bit of sugar. She’s not alone. “I hate breakfast,” many patients candidly reply. That’s unfortunate, since studies show besides emotional resilience, eating breakfast consistently correlates with longevity and a healthy weight. Eating breakfast is just that, “breaking” the overnight “fast.” Eating upon waking brings your blood sugar levels back to normal, kick-starts your metabolism, and sets you up to be on an even metabolic keel for the rest of the day. So break your fast every morning. It will make you healthier, give you more energy through the day, and help you lose weight. The old proverb “Eat breakfast like a king, lunch like a prince, and supper like a pauper” now has some scientific muscle behind it. Many of us think that if we skip breakfast we will reduce our overall calorie intake for the day and lose weight. Unfortunately, the opposite is true. Not eating breakfast means you will eat more the rest of the day. One study among healthy lean women found skipping breakfast impairs insulin sensitivity and leads to weight gain. If you want further proof, look at sumo wrestlers, who never eat breakfast. They wake up, and the first thing they do is start exercising vigorously. This combination of skipping breakfast and then training really hard for five hours means that by the time they get to eat, they are starving. As a consequence, they overeat. Something very similar happens when you skip breakfast, work through lunch, and finally return home in the evening: you eat everything in sight. You feel stuffed, sick, guilty, and regret ever entering the kitchen in the first place. I see a definite pattern among patients who skip breakfast and then experience evening hunger and cravings. A recent study found that almost 3,000 people who lost an average of 70 pounds and kept it off for six years ate breakfast regularly. Only four percent of people who never ate breakfast kept the weight off. The only difference between the two groups was that the group who lost weight ate breakfast and the other group did not. They both consumed the same number of calories and the same types of food. It turns out that it’s not only the type of calories you consume that determines losing weight and maintaining weight loss, but the time of day you eat as well. Does skipping breakfast and eating a large meal just before sleep sound familiar? It should. It’s the American way. We consume most of our daily calories shortly before bed. We rarely eat breakfast. We hardly make time to eat during the day, and by the time we get home we are literally starving, we often consume more than we need and then go to bed or sit in front of the television or computer while munching on more snacks. Then we do the one thing that guarantees to make us gain weight: we go to sleep. No wonder we are looking more and more like sumo wrestlers every day. Equally bad are those who make breakfast dessert. If you eat empty calories from refined foods (such as doughnuts and sweet rolls) and sugars, you will tend to eat more overall. You would never eat ice cream for breakfast, but many cereals, toaster concoctions, muffins, and other things that pass as breakfast – even “healthy” choices – contain as much if not more sugar. You’re essentially eating dessert. So eat breakfast, but do it correctly. Bypass the cereal aisle and whatever vitamin-fortified concoctions that carry a healthy halo and try to pass off as a smart breakfast. Studies show protein-rich breakfasts can improve satiety and reduce evening snacking. Another showed a protein-rich breakfast helps reduce your hunger hormone ghrelin2 and increase cholecystekinin, which signals your brain to stop eating. Protein-rich foods like eggs, nut butters, a protein shake, or whole grains with nuts steady blood sugar and reduce metabolic fluctuations later in the day. Among the countless duties that confront us in the morning, many people struggle to have time for breakfast. That has always puzzled me, since you can make a healthy omelet with plenty of colorful vegetables in minutes. If even that seems too much, or you’re just not that hungry in the morning, try a breakfast smoothie. You can pre-prep it the night before so the whole thing takes maybe 10 minutes the following morning. Here are six of my favorite smoothie recipes that provide protein, healthy fats, antioxidants, and major flavor in less time than it takes to order a designer coffee. This is one of my favorite breakfast or post-workout smoothies. 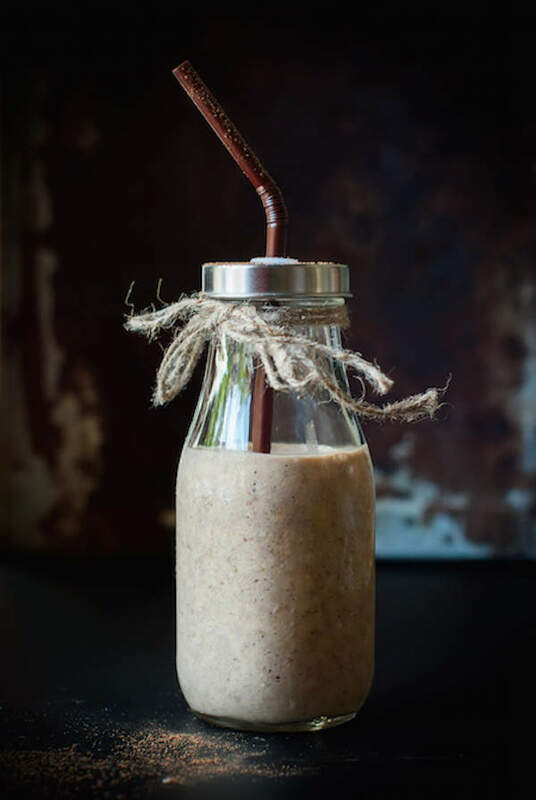 It’s filled with healthy fats from chia seeds and almond butter, and it features one of my favorite nutrient rich berries. The whole family will love this one. Step 1 Combine all of the ingredients in a blender and blend on high until smooth, 1 to 2 minutes. if the smoothie is too thick, add a little filtered water and blend again until it reaches the desired consistency. Step 2 Pour into your favorite glass and enjoy! Dessert for breakfast? Yes, please! 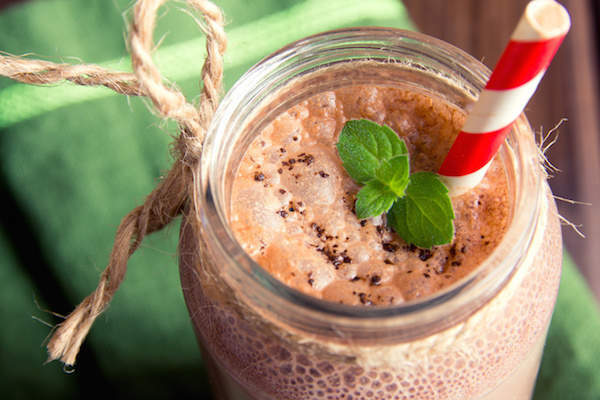 This creamy cocoa smoothie from my 10-Day Detox program has the perfect combo of fats + protein to energize your morning, and it tastes great. Step 1 Combine all of the ingredients in a blender and blend on high speed until smooth, 1 to 2 minutes. If the smoothie is too thick, add a little water and blend again until it reaches the desired consistency. 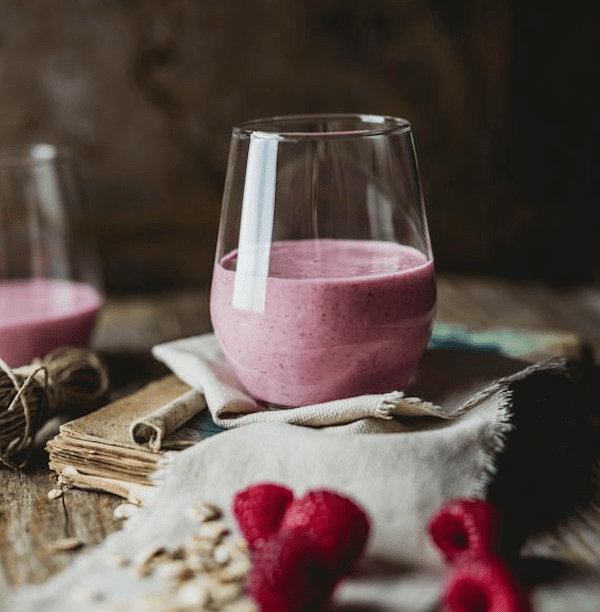 With nutty almond milk and creamy almond butter, this raspberry smoothie from my new book, Eat Fat, Get Thin , will blast off your day with healthy fat, antioxidants, and phytonutrients. Step 1 Place all the ingredients in a blender and start to blend on low speed, gradually increasing to high speed. Blend until creamy and smooth. Chocolate lovers, rejoice! This smoothie from my new book, Eat Fat, Get Thin is power packed with creamy, healthy fat. Cacao not only adds great flavor, but is a good source of antioxidants, vitamins, and minerals. Step 1 Place all the ingredients in a blender and blend until smooth and creamy. This mango-coconut smoothie is the perfect beverage in the morning or for a post-workout or midday snack. It’s filled with healthy fats like hemp seeds, nuts, and coconuts, and best of all, it’s delicious. Even the kids will love it! Step 1 Cube the mango by cutting the large section of fruit away from the center of the pit. Slice each half into thirds, turn and cut into thirds again. Flip the mango section so the cubes are revealed then use a spoon or knife to cut away the chunks. Place in the freezer to chill thoroughly ( about 20-30 minutes). Step 2 Place the chilled mango, hemp, coconut water and coconut butter into a blender and blend on high for 45 seconds or until desired consistency. 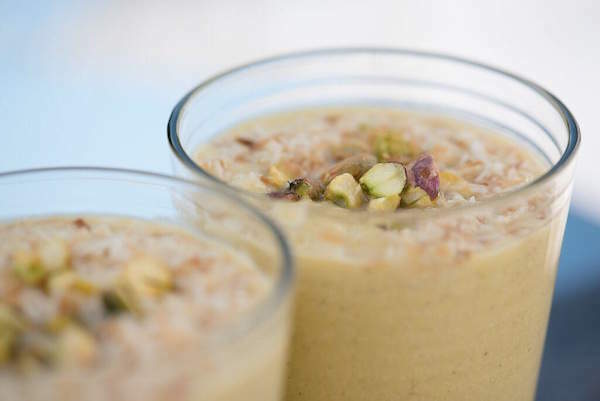 Pour into 2 glasses and top with the coconut and pistachios. This Spiced Pear Smoothie is the perfect fall beverage without all of the sugar and processed ingredients in typical pumpkin spiced drinks. 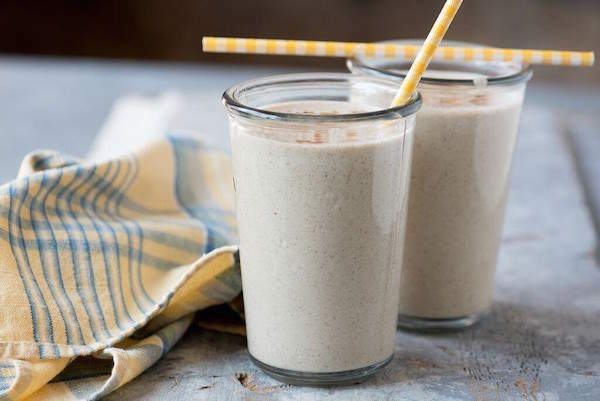 This smoothie also includes one of my favorite milk alternatives, Brazil nut milk. Brazil nuts contain healthy fats and selenium, a trace mineral essential to immune and thyroid function. Healthy and delicious! 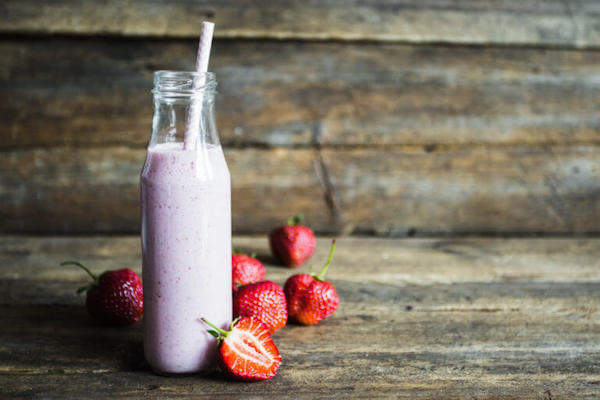 INGREDIENTS For the Brazil Nut Milk 1 cup Brazil nuts 5 cups water For the Smoothie 2 cups chopped pears (freeze before blending) 1 teaspoon of alcohol-free vanilla extract 1 rounded tablespoon pumpkin pie spice mix *For a sweeter option, add 1-2 dates. Step 1 First make the Brazil nut milk by soaking the Brazil nuts in 2 cups of water overnight or for a minimum of 8 hours. Drain the water, rinse the nuts well. Step 2 Place the Brazil nuts in a blender and add 3 cups of fresh water. Blend for 45 seconds and then strain the liquid through a fine mesh strainer. Place in the fridge to cool. Step 3 In a blender, combine the milk, chilled pears, vanilla, spice mix, and dates (if using). Blend on high speed for 45 seconds, until smooth and creamy. Mark Hyman MD is the Medical Director at Cleveland Clinic’s Center for Functional Medicine, the Founder of The UltraWellness Center, regular contributor to the Today show, Good Morning America, and The Dr. Oz Show, and a ten-time #1 New York Times Bestselling author. 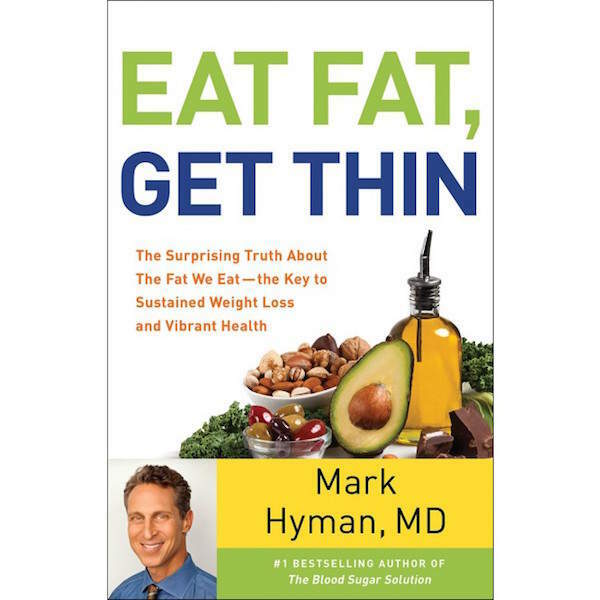 As one of the most influential people in health and fitness, Dr. Mark Hyman is helping people all over the world lose stubborn weight with his books 10-Day Detox Diet Cookbook and The Eat Fat, Get Thin Cookbook . 1 Hamid R Farshchi, Moira A Taylor, and Ian A Macdonald, Deleterious effects of omitting breakfast on insulin sensitivity and fasting lipid profiles in healthy lean women 1,2,3, 2005 American Society for Clinical Nutrition. 2 Leidy HJ1, Ortinau LC, Douglas SM, Hoertel HA., Beneficial effects of a higher-protein breakfast on the appetitive, hormonal, and neural signals controlling energy intake regulation in overweight/obese, “breakfast-skipping,” late-adolescent girls., Am J Clin Nutr. 2013 Apr;97(4):677-88. doi: 10.3945/ajcn.112.053116. Epub 2013 Feb 27. What makes your recipes any different than any others? I have hypothyroidism and have been trying to lose weight, but so far have failed. I’m looking for recipes that actually work and from what I see, yours aren’t any different than any other websites. Am I wrong? Oh the weight gain is horrible!